At the age of thirty-five, after practising austerities for six years, Siddhartha Gautama vowed to remain beneath a Pipal tree at Bodhgaya until he realised a path beyond suffering. He faced many trials from Mara, Lord of Illusion, who attempted to distract him from his purpose. Then, during a full-moon night in May, after receiving an offering of milk with rice from Sujata, Siddhartha went into deep meditation. As the morning star appeared in the eastern sky, he reached his goal and became the Buddha Shakyamuni. When the Buddha stood up at last, he gazed at the tree in gratitude for its shelter. 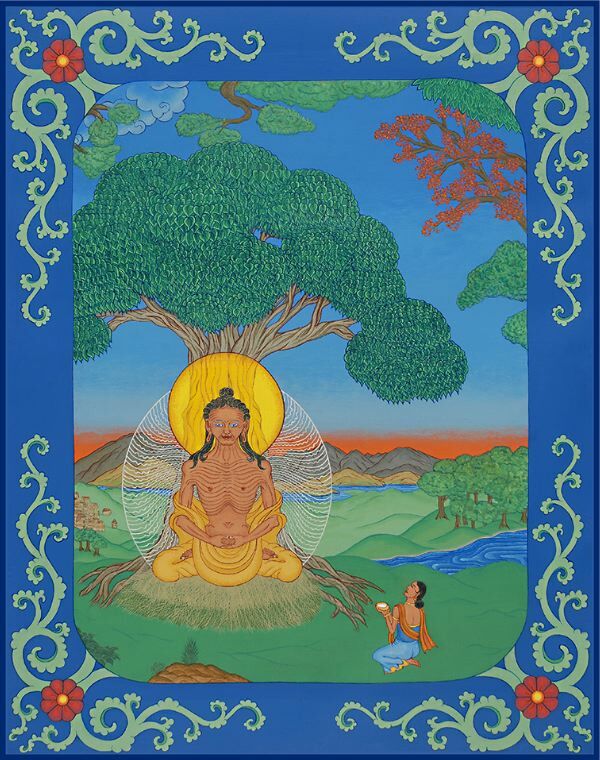 From then on, the tree was known as the Bodhi tree, the Tree of Enlightenment.